Rally participants, led by (l. to r.) Pat O’Brien Townsend of the Montana Nurses Association; Jamie Cross, event organizer; and Janette May (and pup Gertie), cancer survivor, begin the mile-long march to the picket line. 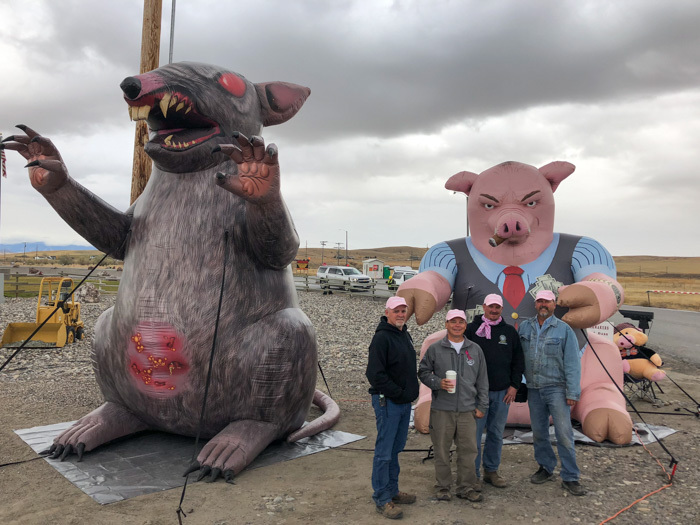 Joined by a giant rat and pig just outside the Imerys Talc gates, L-D239 members wear pink to honor a Breast Cancer + Health Care Awareness event. “What we’re going through with the lock-out doesn’t compare to what a person fighting cancer or another serious illness faces,” L-D239 president Randy Tocci told the small-but-passionate group gathered for the October 27 rally at the Frontier Club in downtown Three Forks. 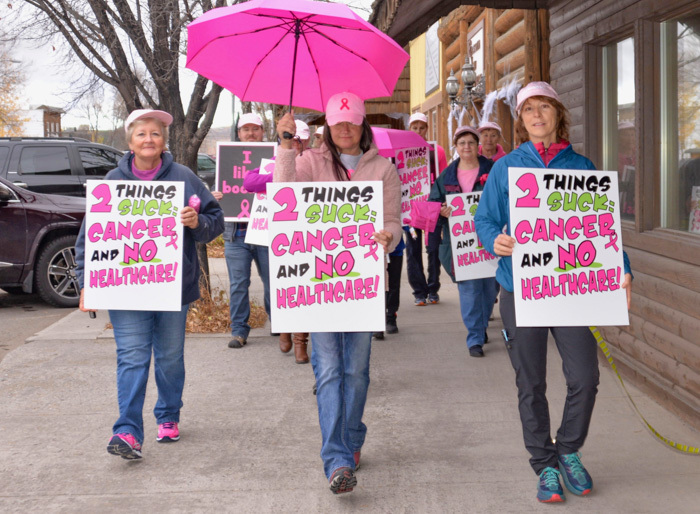 After hearing from several speakers, including a representative from the Montana Nurses Association and a cancer survivor, rally participants took up signs and marched nearly a mile to the Imerys picket line. Participants received information sheets listing local resources offering low-cost or free preventive and treatment services. Tocci’s wife, Jamie Cross, who headed the event, said she hopes to replicate the rally and walk and possibly make it an annual event.